RP72991BL is rated 5.0 out of 5 by 1. Rated 5 out of 5 by KBean from Beautiful great product I ordered this in champagne bronze & paired it with the Delta Trinsic one hole champagne bronze faucet. It fits perectly, looks beautiful & functions great. Is this escutcheon plate compatible with TRINSIC&reg;&nbsp;Single Handle High-Arc Bathroom Faucet&nbsp;MODEL#: 559HA-GPM-DST? can you use this escutcheon with your 559ha-ss-dst faucet? 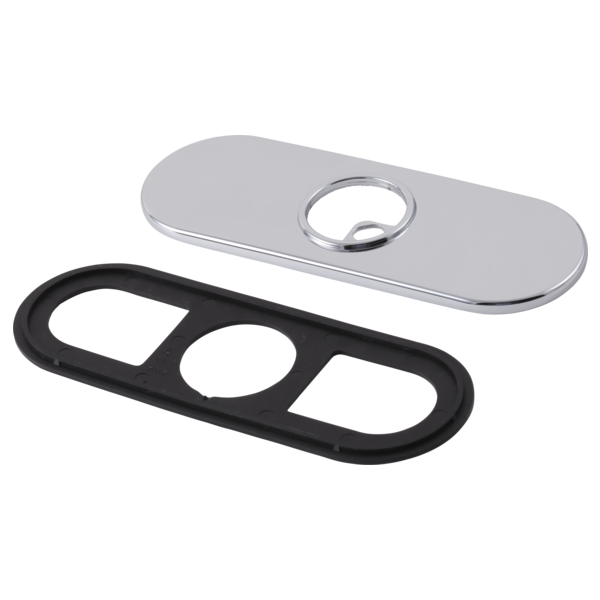 do you have an updated escutcheon that can be used with your 559ha-ss-dst faucet? what size is this escutcheon - RP60146? Can I use it with 4159-DST? Can I use it with 4159-DST? Seeking an 8-10&quot; escutcheon rather than 6&quot;. Product info does not show size. We have a single hole Trinsic with a 3-hole vanity. Seeking escutcheon. Know that RP72991 is 6&quot;. How can we find one that is 8&quot; or 10&quot; when sizes are not on website?